Seriously, how do you Conquer Your Fears? Have you ever heard the cliche statement, “Ignorance breeds hostility?” Alas, in actuality, ignorance breeds and produces fear, which in turn often breeds hostility. Right off, “ignorance” is defined as a “lack of knowledge, education, or awareness” according to Merriam Webster. Unfortunately, way too many folks think of ignorance as a derisive and undesirable condition, but in actuality, ignorance is the absence of knowledge, either intentional or unintentional. Let’s face it. We need a certain amount of fear to keep us physically safe. Remember burning yourself on the stove as a child? Or perhaps you had that deep fear of going to the dentist. Bets are that you do and that you conditioned yourself to avoid such an error again. However, most adults have myriad baseless fears of things that are primarily based on the ignorance of the “scary” catalyst. Ironically, almost polarly opposite of ignorance is confidence, as long as it is not to the extreme. It is undeniable that even the most confident quarterback has indeed been sacked. Following are a few “fear catalysts” in which education and exposure (via the suggestions) would help conquer fear and help rid yourself of that stumbling block. Fear of Flying: Learn aerodynamics, and you will soon realize that the airplane would rather fly than not. Fear of Dentists: Yes, we all have the fear of having someone’s hands in our mouth, the drills that dentists use and sometimes even having a tooth pulled. It’s not fun. Even having your mouth numb may concern you because it could go away at any point and cause you harm. But, going to the dentist is also a necessity if you want to have clean teeth and keep up your oral health. Know that the dentist and the assistants are there to help you and make you as comfortable as possible. Fear of snakes, spiders, and other insects: Educate yourself and learn that almost all of these creatures want to avoid you first. They all have a necessary niche in this world. Learn what that purpose is and empathize with the creature. For example, most people are ignorant of the fact that the bee population is critical to human existence because they pollinate the plants that feed other animals in the food chain! Face Those Fears Today and Soar! Thank you for sharing this as it helps to humanize the fear trap. If you are alive and in a body then of course you will experience fear yet at the same time, it doesnt denote that those fears are true. I appreciate how you approached overcoming fear by emphasizing knowledge/education followed by action vs just rambling on about becoming “fearless”. I have read many posts before on becoimg fearless yet without practical steps. After reading this post I realized most of our fears are actually laughable but to the mind, not so humorous. If we took one daily action in the face of our fears, we might just surprise ourself about how capable we are. Easy to comprehend, not so easy to put into practice. I remember a friend saying, “the only thing really to fear is the thoughts between your two ears”. I appreciate the reminder that the “real” fear is inside and through action the paralyzing effects of fear begin to lessen. 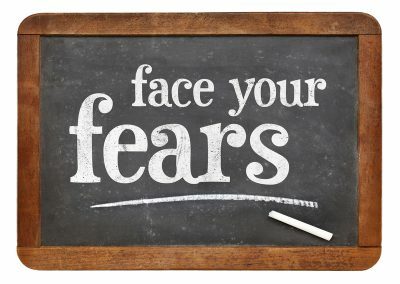 I have noticed in my life the voice of fear increases during times of transition, when dwelling on the past and/or projecting on to the future. No matter how small, I have decided to take steps in the direction of my fears. Its sure better than staying stagnant. I look forward to more posts like this (practical spirituality)!